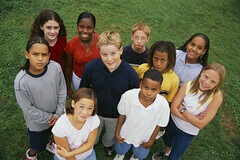 Between ages 10 to 12 years, children’s social and emotional skills (see full Glossary) are developing well. They are interested in others around them and really want to fit in. Their self-esteem is developing and solidifying itself, but they still rely on those around them, for positive support and feedback. take into account the points of view of others. show genuine concern if someone is hurt, physically or emotionally. Children at this age often have a best friend (Fig. 2) with whom they will spend most of their time. Best friends help children understand the complexities of the world and how unpredictable life can be. Best friends are often each other’s “rock.” They provide each other with a solid shoulder to lean on. Children at this age are extremely aware of their bodies, and they start to value their privacy (though not necessarily that of others). They may demand that you knock on their door before entering their room. This is a typical part of growing up and should not be seen as a sign of rejection. Your child, who is now pre-pubescent, is just getting ready for the next big stage in his or her life: adolescence!